What is an Advance Parole Document? 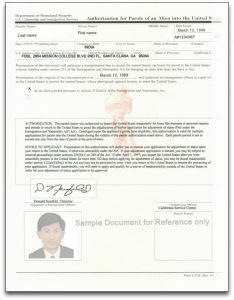 An Advance Parole Document is a form of temporary travel authorization. Nonimmigrants in the United States (such as adjustment of status applicants, TPS beneficiaries, refugees/asylum applicants, etc) must obtain Advance Parole to get permission to reenter the United States after traveling abroad without jeopardizing their status. 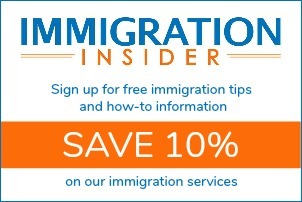 Advance parole works like a visa when entering the U.S. Unlike a Reentry Permit, an Advance Parole Document is printed on a standard, letter-size piece of paper. Immigration officials may refer to it as Form I-512L, Authorization for Parole of an Alien into the United States. 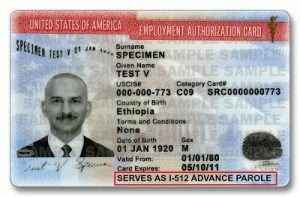 For applicants who apply for Advance Parole together with an Employment Authorization Document (EAD), USCIS issues a “combo card”, a version of the EAD card which contains the words “SERVES AS I-512 ADVANCE PAROLE.” An example of this Advance Parole Document is pictured below. Lawful permanent residents (green card holders) and conditional permanent residents do not need to apply for travel documentation. Permanent residents may travel abroad without special permission. However, a reentry permit may be needed by permanent residents that travel abroad for more than one year, but not more than two years. To obtain Advance Parole, the applicant should file Form I-131, Application for Travel Document, and receive approval before traveling. Form I-131 must be approved and the travel document issued before the applicant leaves the United States. In fact, if an adjustment of status applicant travels outside the United States without an AP Document while Form I-485 is pending, his/her case will be presumed abandoned and denied. Depending on the immigration status of the applicant, USCIS may approve parole for a single use or multiple uses. Multiple-use AP Documents are generally valid for a one year period from the date of issuance. Generally, you do not need an Advance Parole Document to travel directly between parts of the United States, which includes Guam, Puerto Rico, U.S. Virgin Islands, American Samoa, Swains Island and the Commonwealth of the Northern Mariana Islands (CNMI), without entering a foreign port or place. However, check with your transportation carrier first to ensure the trip is direct. How do I request expedited processing of a travel document?